Well, Celtic got the draw that GGW had identified as the best option to ensure their qualification for the 4th Knock Out Round of the Champions League, when they came out the urn along with HJK Helsinki. Helsinki can prepare for a green invasion on 8th August although hopefully the outcome of the tie will have been secured in the first leg game at Celtic Park the week before. Any Celtic fans planning to travel to Helsinki should take loads of money given the extortionate price of beer, with even a small bottle costing about £6 and pints working out nearer £10 a time. Cynics attribute the high Finnish male suicide rate to this phenomenon. HJK have been Finnish Champions the past 3 seasons and lie second as the current season approaches its climax. They have regular European experience with the highlight being 1998-99 when they became the only Finnish team ever to reach the Champions League Group Stages. They did not qualify but were not disgraced with a home win and an away draw against Benfica the pick of their results. 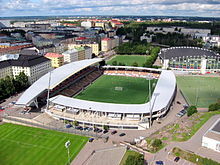 However they have never come close to that level in the past 12 years and while memories of Utrecht will stop Celtic being complacent, it would be a major shock even in Finland if Celtic were unable to overcome this opposition over two legs. Earlier this week HJK won their Second Qualifying Round first leg game 7-0 so Celtic fans need to waste no time on KR Reykavik the linked team in the draw. It will definitely be HJK that Celtic face. As the 7-0 scoreline might suggest, HJK are an offensive side who regularly play with 3 forwards, in defiance of the modern trend to only one striker. For the current campaign HJK invested in two new forwards. Juho Makela, a Finn who was on Hearts books a few years ago without making any impact, was brought back from Australia and has been scoring freely in the League. He contributed a hat-trick against KR so Celtic’s defence should give him no leeway, without having to tremble in their boots. The other signing was 24 year old Demba Savage a Gambian internationalist who can play a bit and will need careful watching. 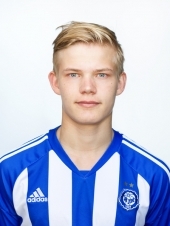 But the third forward is the one Celtic fans should really watch out for, 17 year old wonderkid Joel Pohjanpalo. GGW suggests all readers of this post should Google his name on You Tube to see him score a hat-trick in 3 minutes in a recent Finnish match. The fact that one goal was from a header, another with a right foot shot and the third from a left foot shot indicates the all round level of skill this young player possesses. Finnish commentators reckon he is certainly the best young player they have produced since Jari Litmanen and possibly with even greater potential. Celtic could do far worse than buy him up, after they remove HJK from the competition. In defence the man Celtic will have to beat to advance is club captain, the 36 year old goalkeeper Ville Wallen. In front of him the back four is led by another two over 30s Rami Hakenpaa and Tuomas Kansikas. The Celtic front men should have too much pace for these tiring old legs.